Am I right to think that english ship building where different from the dutch way? If so why was the dutch wshipbuilding more popular in Sweden? I'm reading a biography about Karl IX (Gustav Adolfs father) ant it seems that Sweden had "ok" relations to both the dutch and english countrys. Also when did the dutch shipbuilding come to Sweden? Ha! This was the subject of my dissertation, which you can read in my book The Philosophy of Shipbuilding (Texas A&M Univeristy Press 2004).In the early 17th century, there were two main construction methods being used for large carvel ships in northern Europe. In England and France, the whole-moulding methods developed in the Mediterranean in the Middle Ages had been rapidly adopted in the 15th century. In this method, which survives today, the basic forms of the ship are drawn out on paper or full size to develop the shapes of the frames. These are cut out and set up on the keel to define the shape of the hull and then covered with planking. There are many different geometric methods available for determining transverse and longitundinal curves, and people started writing treatises about what the best curves were already in the 14th century. The earliest surviving northern European work on ship design, Mathew Baker's manuscript from the 1580s, follows this basic methodology. Design in this way allowed the establishing of benchmarks and rational improvement based on careful control of hull shape and eventually led to naval architecture as we know it today, but it required a fairly sophisticated grasp of geometry. In the northern Netherlands, there were no drawings in use. Instead, the hull was laid up in a different order. Once the keel and posts had been set up, the bottom planks were assembled out to the turn of the bilge, held together by clamps,shores and blocks of wood nailed across the seams. A mould or two might be used to control the deadrise, but it might be established by eye or by measurement from a centerline. Once the bottom was planked, the floor timbers were cut to fit and fastened in place. As they were added, the temporary blocks were pulled and the nail holes filled with little whittled pegs. The floor timbers stiffened the bottom and allowed it to serve as a base on which the rest of the ship was built. Futtocks to define the shape of the sides were set up between the floor timbers and faired with battens and eventually the wales.The space between the outermost bottom plank and the lower wale could then be planked. This method, although it limited the range of hull shapes which could be built somewhat, was very edfficient in its use of materials and manpower, since frames did not have to be carefully squared so that they could be matched to drawn curves and the bottom planks could use the full extent of the tree's width. Dutch merchants had also mastered the wood market and could provide materials at the best prices, so Dutch ships cost less per ton of capacity to build and were thus popular with owners. Both methods produced ships which had similar structural properties, since they used planks and frames in similar ways, but the design and construction methods were quite different. By about the middle of the century, people building in the Mediteranean/English/French tradition had caught up to the Dutch somewhat in efficiency and the limitations on hull form had moved the market away from Dutch construction. The Dutch method also did not lend itself to the growing bureaucraticization that affected naval construction as the century developed - it generated no drawings to allow the customer to evaluate the design in advance, and no paper trail to follow if things went wrong. Dutch shipwrights began using drawings sometime in mid-century and largely abandoned the bottom-based method for large ships. Dutch shipwrights had been working for the Swedish navy since sometime in the later 16th century, and under Karl IX large numbers of them were recruited (his rival Christian IV in Denmark was doing the same thing). Karl had begun building ships even before he was king, establishing a navy for the revolt he led against King Sigismund while he was Duke of Södermanland in the 1590s, and this became the basis of the royal navy after he deposed Sigismund in 1599. Henrik Hybertsson, who designed Vasa, moved to Sweden in 1602 or so to work for Karl. Dutch master shipwrights continued to dominate the Swedish navy yards until the 1660s, when the navy under Karl XI began recruiting English and Scottish shipwrights such as Francis Sheldon, who came to Sweden in 1660 (I have a model he built that year for the king sitting in my office). That is the short version! Wow, thats a wonderful model to have! Is it possible you could post a picture of that model? It would be really interesting to see. Thanks for the eplanation, I had a feeling the lower cost would be part of the answer. I'm interested in Karls life, he seems to have been ready to overcome anything to reach his goals, even if he got bad blood on his hands, yet at the same time seems to have been a caring father that became depressed when his children died. A complicated personality living a very complicated life. I knew he was very forward as a duke in making his realm organized and productive. He was early with making productions of gunpowder and cannons, something that would be important later on. I missed that he built the fleet to revolt, but thought he wanted a strong fleet for his realm and his exports, not primarly to revolt against Sigismund. Are there scientific findings about the building-methods of the Mary Rose (built 1511) and the Kronan (1665)? What are the characeristics for a ship, built by plans to observe at archaeologic findings? What are the oldest plans preserved? Of course I'm also very curious about the old shipmodel. I actually have pictures (although not too great, since the lighting was a little bad for my camera) of this model, and could post them with Fred's permission, otherwise Fred can post some. I thought it was pretty neat to look at such a model in person, especially since I hadn't seen a period built one like this before except in pictures. Even though it is quite amazing, there is little planking except for the wales (nice in a way to be able to see the framing), and parts of it look rebuilt during a more modern time since the wood is lighter in color, especially at the stern, and one of the starboard side sections of a wale at the bow. Many of the sculptures are there too, except there probably would have been more covering the rebuilt part of the stern. And it is an unrigged model. And thanks for the shipbuilding bit Fred! Mary Rose appears to be built according to the whole-moulding method, although the hull has not yet been recorded in sufficient detail to know much more. Kronan was desigend by Francis Sheldon and so probably based on drawings. Examination of the wreck (I worked on the excavation for two seasons) suggests fairly typically English construction. Trying to derive the design and construction method from the remains is one of the big challanges in this field, and there are a wide range of clues to look for. In Dutch ships, the plugged nail holes from the temporary fastenings are the best clue to the construction method (we see these all over Vasa), but one can also look for fastenings between the planks (tips of scarfs nailed to adjacent planks) as an indication that the planks were used as a major element in defining the form. Ships built from plans more often have some or all of the frames built up into solid units, with floor timbers and futtocks fastened together into made frames. We see this in Iberian ships from the 13th century onward, for example. It is also common to see markings on the frame elements that show that they are being cut and fitted to patterns. Earliest known hull design drawings are from the 1430s, although they are showing a design method that is at least a century older. I will post a couple of pictures of the model. Being Dutch I was triggered by the answer Fred gave to Matti's question. Because I wanted to add some comments to the story about Dutch shipbuilding Fred posted, I immediately became forum member. I must first explain that I didn't read Fred's book 'The Philosophy...' (yet), so if I jump to the wrong conclusions I am sorry for that and want to apologize to Fred on forehand. Fred states that in the northern Netherlands no drawings were used. This is unlikely, since Rembrandt painted a picture of a northern Dutch shipwright holding a technical design drawing for a ship, in 1633. I have reasons to believe these type of drawings were commonly used, even in the Northern method, but just didn't survive. Witsen describes in 1671 that he inherited a great deal of drawings from his father when he died in 1669. Only a couple of Witsen's, and other's, drawings have survived, and are saved at the Amsterdam museum. It's a shame treatise writing was not something the Dutch exceled in, as Witsen, being the first Dutchman to do so, had to admit in 1671. That same Witsen gives a somewhat different description of the building process of the northern method as Fred does. Fred says that all the floor timbers were placed after the laying of the floor planks. Witsen describes that at first only a part of the main frame was placed after the laying of the floor planks. This 'mould' consisted of one floor timber and two first futtocks. After placing that mould, the planking was continued to the top-side of these two futtocks. Then two second futtocks were placed at the main frame position to determine the shape of the sides of the ship. After this, a batten ('scheerstrook' in Dutch) was placed to determine the greatest width for the whole length of the ship. Not until then, the other floor timbers and all first and second futtocks were placed. The third futtocks were not placed until the major part of the interior planking was finished, and the beams for the lower gun deck were placed. I included a couple of sketches that, I hope, make clear what I'm trying to say. The first sketch shows the situation at the main frame after the planking of the floor is completed. The second sketch shows the situation at the main frame after placing the 'mould' consisting of the first floor timber and the first two futtocks. The third sketch shows the situation at the main frame after boarding up higher ('boeien' in Dutch) and placing the two second futtocks and the batten. This is the situation right before the rest of the floor timbers and all the first and second futtocks were placed. I hope these sketches also make clear that the shipwright had to determine the shape of the hull at the main frame, before any building activity could commence: the shape of the first and second futtocks had to be determined on forehand. And, what's more... the shape of these parts can be seen on the drawing in the hand of the 'Rembrandt-shipwright' of 1633 and Witsen describes the method to determine the shape of these parts in his description of the northern method in his work of 1671. Fred also states that by mid 17th century the 'bottom based' method was abandoned for large ships. This is not likely. Witsen describes the method in 1671 and repeats his description in 1690. Ralamb describes the method in 1691 and Van Yk mentions it in 1697. Aubin still describes it in 1702 (based on Witsen). French spies mention the method for the Amsterdam Admiralty (where the biggest (app. 170 foot) war ships were built), in 1670 and 1672. I hop I am allowed to ask a question too. Can anyone tell me when it was determined that Vasa was built according to the northern Dutch method? Landstrom already assumed so in 1980, no doubt on indications given by Stolt. Was he the first to publish this? The museum shows the northern method in its diorama of the warve and in several displays of the ship during different stages of the building proces. Were these models made after Landstrom, or before? When I read recent publications, it looks like it has only been recently determined that Vasa was built according the northern Dutch method. PS. Fred, thank you very much for answering all the technical questions in incredible detail. Where do you find the time? Oooo...Some challenges to Fred's expertise! I am looking forward to hearing what he says, and to following this discussion. I think that part of the reason why they think that Vasa was built in the northern Dutch method is simply who was hired to do it: two Dutch brothers. And another part is the physical evidence as Fred mentions above; plugged nail holes where pieces of wood were temporarily attached to hold planks together, scarph joints nailed together and maybe other evidence that I am unaware of. Jules has filled in a lot of the detail in my over-simplified explanation of the basic differences, with some good references to Witsen, and I hope he will forgive me for doing some injustice to the details in the process of compressing the explanation into such a small space. I can answer a couple of his questions, and make a few comments. In using the Dutch treatises (Witsen 1671 and vn Yk 1696/7) it is important to remember who the authors were and what their source material was. Witsen was not himself a shipwright, but an excellent collector and collator of information, while van Yk was a practicing shipwright and his work probably reflects the practice of his own time. Some of what Witsen includes in his work was already outdated in the 1670s - many of the examples of contracts he provides for ship specifications date to the 1620s and 1630s - and the bottom-based method he describes was dismiised by van Yk as very old-fashioned. Although authors continued to describe it, and small vessels continued to be built in large numbers with this method right into the 20th century, it gradually went out of common use for big seagoing ships. Archaeological evidence for this construction process in big ships is largely confined to ships built before about 1650. It does not mean that it disappeared entirely, but it was decidedly old-fashioned in the later 17th century. I have always wondered about Rembrandt's painting of the shipwright and his wife. The little drawing he is working with is far too small to be of any real use in the ship design process, it is more like the illustration from a textbook. It suggests that shipwrights were aware of drawings, but I would be hesitant to use it as proof that they were commonly used, and just because the shipwreight is from a northern town does not mean he worked in the northern style. As far as I recall, the earliest drawings which survive in the Scheepvaartsmuseum archives (and which look something like the drawing in Rembrandt's painting) are usually dated to the 1640s, and I think they indicate that drawings started to replace the bottom-based method already in the second quarter of the 17th century. Not all ships built in the northern Netherlands were necessarily bottom-based, it is entirely possible that some frame-based ships were being built alongside them. Perhaps Rembrandt's shipwright was one of those innovators, and wanted the drawing in the picture to show what a modern, scientific guy he was. Ab Hoving, in his work with Witsen and other sources, has demonstrated pretty clearly that the information included in a specification is sufficient to build a moderately sized ship without drawings or many geometric tools, and as a former shipwright I tend to agree with him that the bottom-based method did not require drawings. I strongly recommend his annotated translation of Witsen to any reader interested in the details of Dutch ship construction in the middle of the 17th century. There has been some debate about whether Vasa was bottom-based in earlier publications. Eva Marie Stolt believed that the ship was built in the southern Dutch tradition, as did Ab Hoving initially, but Landström thought otherwise. I do not think Landström's conclusion was based on observation of details, and it predates the widespread publication of the archaeological evidence for the method as discovered in ships reclaimed from the IJsselmeerpolders. Landström's illustrations largely follow what Witsen shows and I think are clearly derived from that source, which Landström knew well. His illustration of the initial phase of construction, with the bottom planked out to near the turn of the bilge, is also clearly based on the well-known Dutch engraving showing a ship at a similar stage, even to showing an incorrect bottom form for Vasa (Landström omits the knuckle between the garboard and first broad strake and shows too much deadrise throughout). The first proof (using that word with a little caution) that Vasa was bottom-based did not come until 2008/9, when we removed two of the bottom strakes to inspect the space behind as part of the process of rebolting the ship. 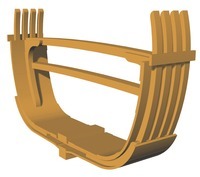 This is the first time that it was possible to look at the inner faces of the strakes that would have been assembled without frames, and it is these faces which provide the most conclusive evidence of the construction method. Wooden cleats nailed across the seams might be found on the outside of a frame-built hull, either as part of the original construction or repairs, and so by themselves are not proof of how the bottom was constructed. Hoving has also demonstrated that the shape of the bottom is also not definitive, although it was once thought so. One has to look at the inner faces of the bottom planks. When we were finally able to do this, we found the unmistakable evidence of cleats nailed across the seams on the inside in parts of the ship that should not have them if the ship was built on pre-erected frames, and some of these cleats were under later frame locations. The plugged nail holes for the cleats are usually found in pairs or groups of three spanning the width of the plank, in this case at intervals of a meter or more. We also found evidence that the tips of plank scarfs towards the ends of the hull were edge-nailed to the next plank inboard, another indicator. We have some evidence for the framing sequence as well. Kroum Batchvarov, who spent a couple of years mapping all of the floor timbers and futtocks through the gaps between planks, believes that there were a number of very heavy frames which were the first ones laid into the bottom at approximately even intervals down the length, a total of five or six, including one very close to the midships position marked on the port side of the keel. There is no evidence that these floor timbers had futtocks joined to them, as Witsen suggests, but it is possible that one or more of these were put in place quite early, to aid in shaping the bottom. It was not uncommon to have at least a midships floor timber set up early to define the deadrise at the widest and lowest part of the bottom, and Kroum thinks that there may have been others in places corresponding to the tail frames in Mediterranean shipbuilding (the frames at the ends of the full part of the hold, where the hull ceases to be relatively straight sided and begins to turn into the posts more dramatically). The shape of the hull also suggests that there was some help in shaping the planks at these locations. Kelby Rose, a PhD student at Texas A&M who is writing his dissertation about the design methods used in building Vasa, has noted a large number of simple arithmetic relationships between key dimensions in the hull, such as the keel length is 4/5 of the length over the posts, and that many of these relationships are similar to what is specified in Witsen. There is also some evidence that the shapes of the futtocks were defined using circular arcs (also noted in the treatises)or some sort of standardised pattern. None of this requires the use of dimensioned drawings, although sketches of key relationships might have made communicating the shipwright's ideas to the workforce easier, especially since the builders of the ship spoke two different languages and came from two different carpentry traditions! And to answer Jules's last question, I love this kind of discussion, so I will always find the time for them! It is one of the reasons I participate in this forum, it make me think about my research in new ways. Thanks for this detailed response! Everything in this thread is very interesting stuff indeed. I am sure Krums method is very reliable, but probably still doesn't beat actually being able to see what is under the planking when the opportunity arises. Thank you Clayton for your response. I am sure the fact that the builders of Vasa were Dutch, helped Landstrom to decide to show the northern 'Witsen'-method. I am surprised to hear from Fred that Landstrom didn't do so because Eva Marie Stolt thought Vasa was built this way. Mrs. Stolt, being aware that the builders were Dutch, concluded that the ship was built according to the southern method. As does Hoving. Hoving concluded that Vasa couldn't have been built with the northern method, because the shape of the hull was too round. Hoving says that ships built according to the northern method can only produce ships with a clear 'knuckle' (as Fred calls it) between the last plank of the floor ('vlak' in Dutch) and the adjacent plank further up. This theory prooved to be wrong. The E81-wreck is very round and built to the northern method. Hoving is still under the impression that the northern method can only produce 'square bottom'-ships. When I asked Hoving last year if he thought if Vasa was built according to the northern or southern method, he said he wasn't sure. Sure, Witsen was not a shipwright, but in this case that is a good thing. Being of a wealthy family assured that Witsen could, at a very young age, travel through Europe to study the different shipbuilding methods. And, luckily so, he was very interested in shipbuilding. His father (Cornelis) was at a certain time a member of the Admiralty of Amsterdam and acquired a lot of knowledge about shipbuilding there. As Witsen (Nicolaes) states in his book, his father was even educated by a shipbuilder. So the family was highly interested in shipbuilding, no doubt because they depended on their ships for their trade with Russia and so depended on ships for their wealth. Fred says the contracts ('certers' in Dutch) in Witsen's work are mainly from the 1620s and 30s, and that's true of course. But Witsen's work also includes contract from later date and a contract for the very large threedecked warship Vrede of 1667. And that prolongues the time frame for the northern method to the 60s. The French spies, Arnoul and Seignelay, prolongue the time frame to the 70s. They have seen the method in the early 70s and even made drawings of it. So it still must have been practiced then. Fred says Van Yk dismissed the northern method as 'very old-fashioned'. The only quote from Van Yk I could find, that comes close to this, is not that harsh. Van Yk only states that the notherners are 'still' working according to the northern method. What of course makes clear that the southerners were, in the past, working in northern style also, but changed to southern frame-first style later. When? I'm afraid we are not sure yet. The Rembrandt painting alone, of course, can not be conclusive. The point that I am trying to make is that when you build according to the northern method, you have to make decisions about form in the early stages of the building proces. For example: the form of the square tuck ('spiegel' in Dutch) had to be determined. (Just ask 7 Provincien reconstructors Dik and Vos what can go wrong with that). One of the other things you have to decide on at the start, is the angle of the scarph in the keel. This determines the rise of the floor along the length of the ship. (Ask Vos again what can go wrong with that). Van Yk shows that records were kept of where the first plank adjacent to the keel ('zandstrook' in Dutch), started to rise above the keel. Van Yk also kept records of the angle the planking made at the tuck. He also makes clear that sometimes, when more ships of one type had to be built, the batten (scheerstrook) from the first ship was saved, in order to use it on the next ship. He also kept records of the turn of the bows. All this, to make sure the knowledge, based on experience, didn't get lost. Later, when the advantages of drawings were recognized, these carefuly guarded 'secrets' were laid down in drawings. Sure, the shipwrights of those days had enough experience to build a ship from a contract. The problem is: we don't. The Hoving-claim that the building method determines the shape of the ship, is, I am sorry to say, wrong. Even Hoving doesn't have enough experience to build a ship on a contract. I started a discussion on ship-shapes with him last year. He works according the principle: just start building a model, the wood will tell you what is possible and what is not. But, as any model builder will tell you, there is almost no limit to how far you can bend a thin piece of wood when it is wet and heated. I tried and could come up with any shape of hull what so ever. Vos has tried this approach while building the bottom (vlak) of 7 Provincien, and came up with an impossible hull shape. Which had to be corrected by, amongst others, Hoving. Who then used a framing system to determine the correct shape. Even in the seventeenth century the northern method delivered good and bad ships. But that goes for the southern method as well. In warship building the contracts changed all the time, so every ship was a first built, only based on previous experiences. But, that is true for these days as well. I have been in specialized machine building for a long time, never had a contract with the same specs twice. Fred, you say that there has been a debate in publications about how Vasa was built. Can you tell me where? I was not able to find anything. Thank you. Fred, thank you for your elaboration on the subject of when the building-method of Vasa was finaly determined. Can I conclude that every proof before 2008/9 is dubious? I think, together with Clayton I believe, the existence of nail plugs, preferably under the floor timbers, forms the absolute proof for building according to the northern method. Theories based on ship form (square is north, round is south) or planking form (carvel is south, overlapping is north), seem to fail. Take the Vasa for example: round but north; first building stage: carvel planking without frame; second stage: carvel planking on one frame; third stage: carvel planking on all frames, fourth stage: overlapping planking on frames. I have read Kroum's work of 2002. Love it! Is the specific work on Vasa he did, going to be published in the Vasa-series? Or is it already available? Can't wait actualy. Looking forward to the work of Kelby Rose. Should be very interesting. Any idea when his dissertation will be published? Can't wait for this either. So, and now I'm going to order Fred's 'Philosophy'. Promises to be a good read. Ah, more and more interesting as we go along! There are a few floor timbers which are more substantial than the others, and some of them are located in good places to be used in shaping the hull, others may only be random occurences based on how big the trees are. The floor timbers are very inconsistent in size generally, with the largest more than twice the sided width of the smallest, are there is no real pattern to how most of them are laid out. As a side note, we now know much more about the contractors who built the ship. They were not brothers, as people have said since the 1950s. Henrik Hybertsson (Huijbertszoon in Dutch sources)was originally from Rijswijk (near den Haag), which is geographically somewhere between north and south in terms of shipbuilding traditions, but he lived in Amsterdam in the 1590s (he owned the house at 18 Warmoesstraat), so may have been trained in the northern method. His background is a little murky, as Amsterdam records list him as a merchant rather than as a shipwright. Arent de Groote was Arent Jakobszoon, born in 1600 and from the Amsterdam area. He was not a shipwright at all, but a merchant, and his involvement in the navy yard was as the purchasing agent. I agree with what Jules says about Witsen - he is valuable precisely because of his background and his broad approach. Witsen and van Yk are complementary sources, and it is a shame that we do not have more, as it is easy to fall into the treatise trap. One tends to assume with a single source that it covers the way things were done accurately. People who study Venetian shipbuilding have the same problem, since even though there are three different surviving treatises on ship design from the 15th century, they are all variants of the same lost original, and there is no way to know if what they describe was the only method in use or even the most common method. The same is true of Witsen and van Yk. The method we think of as Witsen's is certainly one way to build a ship, but equally certainly not the only way, and the archaeological remains suggest that there were several different ways to approach bottom-based construction. The specific framing sequence, for example, could easily cary over a wide range, depending on whether the futtocks are fastened tot he floor timbers and each other or not. In Vasa, dedicated probing of the framing has failed to reveal any futtocks attached to any others, and so it seems unlikely that the exact sequence recorded by Witsen was used here. On the other hand, the indications he gives of where the shaping frames should go match reasonably well to where we have oversized frames that might have been used for shaping. When van Yk notes that the northerners were still using the old method, all it definitely means is that the northerners were still using that method. It does not autmoatically imply that the southerners once used it, only that there was an awareness of the difference. It may be that southerners did use the bottom-based method, and there is plenty of archaeological evidence to support this. It is not surprising that southern builders shifted to a frame-based method first, as the general adoption of carvel shipbuilding and the Mediterranean design methods that came with it followed the coast from Portgual to Britanny to the Low Countries. Bottom-based construction, which had been in use in the region since at least Roman times, was well ingrained not only in the cultural mindset, but was also coupled to the timber trade. The northern Dutch were heavily involved in importing shipbuilding timber from the Baltic into the North Sea basin (as the toll records from Öresund show), and had optimised the trade to their advantage, so the bottom-based method may have continued to yield economic advantages in the north for some time after it began to be replaced farther south. When Hoving was initially investigating this problem, he came to the conclusion that the bottom-based method produced ships with straight deadrise, and that this could be a diagnostic characteristic useful to archaeologists, but later research has shown this not to be the case. In particular, one of the 17th-century vessels excavated in Copenhagen in 1997 was very round-bottomed, but disassembly showed that it had been built in the "northern" manner. I think that Ab has backed away from the flat northern/round southern dichotomy in recent years. Vasa has relatively straight deadrise over most of the bottom, but an easy transition to the sides at the turn of the bilge rather than a hard angle. I talk to him regularly about what we are working on, since it often surprises him. It is not possible to build a ship, or even a small boat, without some sense of where one is going, or perhaps it is more apt to say it is not possible to make a living building ships without some comprehensive idea of the process. Jules gives a good example in the way early decisions, such as the scarf angles in the keel. Part of the key knowledge one needed to be a professional or successful the craft was an understanding not only of what the angles or widths should be, but where the critical decision points were. Some decisions made at the early stages of construction have dramatic llong-term consequences in the later shaping of the hull, while others do not. When van Yk was recording things like the angle of the planking at the tuck, it was because he knew that that was a critical measurement. With the right knowledge of the process, the critical dimensions of a hull could be preserved in a relatively small number of specific measurements combined with proportional rules to generate the others. In this way, it was possible to preserve the shape of good ship and reproduce it, more or less, without the use of formal drawings. Modern gondola builders in Venice have all of the critical dimensions needed to lay out a gondola hull recorded on two pieces of wood, which also serve as frame patterns. On the other hand, there are parts of the process where you have to do what the wood tells you - as Jules notes, you can do things with small model planks that you cannot do with a four-inch oak plank. None of the design methods in use in the 17th century could predict the shape of the extreme bow or stern accurately, and so battens were used to sort out the shape in these places, and some of them, were saved as design aids for later ships. In this sense, the wood is a stronger determinant at full size than in a model, so Hoving is correct as far as some what he says goes, but I think Jules has hit the nail on the head in saying that a 17th-century shipwright could build a ship from the contract alone, but we can't, because we lack the lifetime of experience and detailed knowledge of the process. But my imagination and boatbuilding experience allow me to conclude with some confidence that it is possible to build a big ship without drawings in the modern naval architectural sense. Interstingly, I am having this same discussion with a Spanish naval architect about how ancient Mediterranean ships were deisgned! Concerning proof of how Vasa was built, I would say there was none before we removed the bottom planks - unti you can find the spijkerpennetjes on the interior face of the planking, you never know for sure. There is relatively little of the discussion published - Eva Marie wrote an internal document, and there is a mass of correspondence between her and Ab Hoving. Landström remains the most detailed published source on the construction method. And, Fred, thanks again for the elaborate answers. I agree, it's getting more and more interesting as we go along. With regard to Clayton's question: did Kroum find an extra wide floor timber on the main frame ('hals' in Dutch)? I suppose the main frame for Vasa is on one third from the front of the total length of the ship measured over stem and stern. This should be the position where the first floor timber would be located and I can imagine this one being larger. Thank you for the info on the Dutch 'shipwrights' of Vasa. Surprising news. Can we even still call them shipwrights? Witsen for sure does not describe the only way ships were built in the northern way. But al least he provides the only trustable written source we have for this method. The guy wrote down what he saw, measured parts and presented it in great detail. When you're interested in this building method, there is no other way to gather reliable information, then to read his book; hard as it may be. Even when you're Dutch, as I am, his texts are hard to read, and finding things is a nightmare. But, perseverance will be rewarded. One extra warning: go to the original source, do not trust other people's interpretations of Witsen's texts, they're usually wrong. A lot of reference to Witsen is made to defend constructional solutions that, at the least, seem unlikely. Business as usual: when the source doesn't fit the preconceptions, we discard the source, not the preconceptions. I personally think that there is not another shipbuilding method better documented than the Dutch northern method. Witsen's book gives reliable information, ship models (or still existing photo's from ship models) fill in some of the gaps, and, on top of that, a great supply of archeaological evidence that is expanding every day. Chances to get at least this one right, never looked more promising. Fred, you say that, since no fastenings were found between the floortimbers and the futtocks and between the futtocks, you think that Vasa was not built according to the Witsen-method. In Witsen's method only at one position the first futtocks were attached to the floor timber: at the 'hals'. This set of three frame parts is the only set that has fastenings. The rest of the frame parts are only attached to the planks, not to eachother. I understand that with Vasa this set of three at the 'hals' was not present. Am I right? Thank you very much for sharing your thoughts on the progression of the southern method in the Netherlands. Any ideas on the time frame for the introduction of the southern method? Do you think it was at the same time when carvel-building was introduced in Zierikzee and Hoorn, around 1460? Or much later? Thank you for sharing my view on the 'Hoving-dogma': 'a square ship has to come out of the northern method'. Fred, don't get me wrong, I am in no way saying that drawings had to be used with any ship building method. I think we can be pretty sure that drawings were not used for centuries and still good ships were built. When renaissance came, everything changed. Shipwrights, by learning to write, were more and more inclined to write down the basic principles at first, and their thouights on the subject later. Later, by learning to draw, they saw the advantages of keeping track of their records in a drawing. The problem was however, as it is today, how do you capture the difficult shape of the ship under the waterline on paper? After mastering that, it took another very long time before ship designers made correct predictions for the ships behaviour from a drawing. We're well into the 18th century then. Let's not forget that the 17th century testing approach to ship behaviour, 'we do not know how it's going to behave, so let's drag a model through a water filled basin and see what happens', is still being used in these days. (In Wageningen for example). To build a ship without drawings while applying the northern method, is certainly possible. Witsen shows so. He was trying to capture all the dimensions of all the parts of one ship, by giving these parts dimensions that were derived from the width of the stem. Since he derived the width of the stem from the length of the ship, we can say that he derived all measures for the parts from the length of the ship. After he had done that for one ship, he goes on to say that the dimensional relations for this ship, can be (mutatis mutandis) applied to ships with other lengths and even to other ship types. This approach can also be seen in the 'old' 'table of Grebber', which Witsen included in his book. This table gives the major ship dimensions for a whole range of ships. These dimensions were derived form the length of the ship. For example: length (L): 170 foot, width 42 ft, 5 1/2 thumb (1/4xL), depth 17 foot (1/10xL) etc. Grebber's table also includes measures for determining the shape of certain parts: "the third futtocks hang over at the greatest width: 2 foot 6 thumb." In this way hull design was captured in writing. Witsen expanded on this and tried to capture all the ship parts dimensions in these kinds of divisions. An immense task (he even gives divisions for door posts! ), only to be undertaken by a very young person, who is still very ambitious. Witsen tried to capture the shape of the hull of his ship, a pinas, in writing as well. He determined the shape by taking measures on an actual ship while it was being built. He took several heigth and width measurements at 7 stations along the length of the ship. In this way he registered an array of points on the ships hull and gave us a unique insight in the as built shape of the hull of a 17th century ship. Ab Hoving derived his pinas-shape from the points that were given by Witsen. But, unfortunately, some of the points Witsen gave are not correct and have to be corrected to get a good fair hull shape. And this, unfortunately, leads to interpretation again. (Read Kamer and you know what I mean). Ab also took measures of frame parts of the E81-wreck to check if these measures corresponded with the equations Witsen gives. Risky business, since the wreck was dried and not PEG-impregnated like Vasa. Over the many years, all parts have shrunk considerably. And, on top of that, the guys from NISA told me that all the parts were scraped down to remove a 'crust' that had formed. Again, I am looking forward to Kelby Rose's work; Vasa could provide some interesting answers! After posting my last post, I realized that I forgot to mention that the 'spijkerpennetjes' are not the only indicator for the northern method. No fastenings between frame parts is, I believe, another one. No way to build a ship according the southern method, without fastenings between the structural frame parts. Fred, on your book. Delivery time: 3 weeks, a long wait. But, when I finally get to read it, I will keep your warning about the hammerless people in mind. By the way, I love to confuse people with detail. For me everything has to be right to the last detail. If not, something unexpected may pop up that will shatter my illusions of complete perception. I am still brooding on some detailed tech-questions. I will open new threads for those. One more question for this thread though: who decided to show the northern method in the diorama in the museum and in the several other models in the Vasa-museet, and when? He or she got it right years ago and well before 2008/09. I still can't figure out the time line with respect to Landstrom and Stolt. Thank you. Ps. I included a sketch of a section of a ship at the 'hals', when it is ready to receive the first two third futtocks: completely planked up on the inside, still open on the outside. The beams for the orlop deck and the lower gundeck are in place. I find the impression of Hoving; that a northern method built ship had to give a square bottom and southern method ships were more round and the contradictory evidence for it very interesting. From my very little (much smaller than the knowledge of you and Fred) knowledge of 17th century shipbuilding, it seems that generalizations like this can be dangerous to adhere to. There was so much variation in methods (and not just overall methods e.g. north vs. south Dutch, but also differences in the details of the method) and traditions from one place to another and one shipyard to another that blanket statements can be a slippery slope. It is also interesting to learn that the two Dutch ship builders were not actually brothers. Someone else told me this recently, and apparently the old impression that that they were brothers comes from the fact that they were both very tall, and de Groote means tall (although Google translate tells me it means "the great", maybe the same thing) in Dutch. Over time the de Groote nickname became interpreted as something like a family name so therefore people thought they were brothers. I think I am going to find time to read this thread through again. It is full of detail and information that I find interesting and am curious about, and I think it would be interesting to read the Witsen and Van Yk writings. Do you know where to get copies? I would like to know so much more on this subject. You're perfectly right in stating that with jumping to general conclusions about hull shapes based on the minimal knowledge of ancient shipbuilding we have, you place yourself on a slippery slope; history has shown so. Your translations of the dutch word 'groot' are pretty accurate. I would translate the word in the one meaning with 'big' and 'tall', and in the other meaning with 'great' and 'magnificent'. For example: Charlemagne (Carolus Magnus) is called 'Karel de Grote' in dutch. Good to know you're going to read the thread again. If you have any questions, do not hesitate to put them forward. I can always try to help. To read up on the dutch ship building methods, Witsen's books (1671 and 1690) and Van Yk's book (1697) are all available as free downloads on GoogleBooks. Just type: 'Witsen Aeloude 1671', 'Witsen Architectura 1690' and 'Van Yk Nederlandsche', and they should pop up without problems. The Witsen 1671 is from the library from Gent university. It differs slightly from the facsimile-versions, but not in the chapters that describe the building methods. The differences only concern Witsen's description of the second Anglo-Dutch war (not very friendly on english dishonourable behaviour); some fragments were deleted in the Gent-version, probably sensored because of the feared outbreak of the third Anglo-Dutch war in 1672. Good luck with the reading! I am more than willing to help if you get into trouble with interpretation.